“SLAP students came together in 1999 to organize for power. We recognized that student activists have the unique ability to control their student governments in order to leverage our schools to be on the side of the working class and hold administration accountable to our communities, workers on our campus and the students. Tweleve years later, the SLAP model is bringing together students and workers to win real social and economic justice victories.”- Treston Davis-Faulkner, the first SLAP Coordinator and current National Field Director of Jobs with Justice. 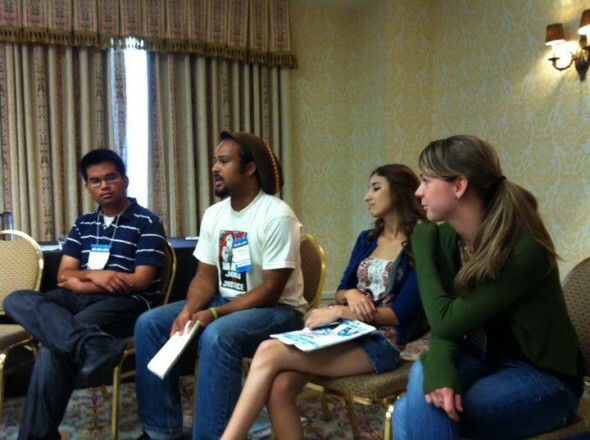 SLAP’s unique model of organizing students as part of a grassroots working class movement is why it has been successful at building student power. Working with Jobs with Justice and the United States Student Association, SLAP supports the growing student movement for economic justice by making links between campus and community organizing. We do this by providing skills trainings to build lasting student organizations and developing campaigns that win concrete victories for working families- all while breaking the poverty cycle by fighting for access to higher education and full & fair employment. This allows students to recognize power relationships in a much larger fight, where students are fundamentally connected to workers and workers to students. The building of an interconnected movement means that students cannot simply walk away from organizing and building power after we graduate; we know that the fight is not over simply because graduation has come and gone. Through SLAP and organizing, we realize how Intertwined our lives and communities are. Those wise words remarking that “an Injury to One is an Injury to All” are a lesson that we students have learned alongside our allies in struggle for social and economic justice. We are SLAP because we believe in the power of organizing students. We are not SLAP because we like to sit around in meetings to discuss surface level changes all day. We are SLAP because we fight against power structures that keep the working class oppressed. We are not SLAP for a silly name. We are SLAP because we are engaged in movement building. We are not SLAP because we just want to go out and get arrested to build our street cred. Most of all, we are SLAP because we win real victories that have a lasting impact on people’s lives. In 2010, SLAP’s power model has lead to victories across the country. At the University of Oregon, members of SEIU 503 are being told that they need to take furlough days as 30 university administrators receive raises. Because they have received the backing of students lead by SLAP, they know that they have the power to strike and win a fair contract and fair working conditions. At The George Washington University, 46 unorganized ironworkers were illegally fired for trying to organize a union at a subcontractor. Members of the Progressive Student Union worked with their local DC Jobs with Justice coalition to win back 23 of those jobs by leveraging both the university administration and local city council members. At UMass-Amherst, SLAP students and workers were able to come together and run a campaign to protect temporary campus employees that had routinely faced abuses from the administration. With the support of the local community, students on campus, and other workers, they overwhelmingly voted to join the union creating over 400 new union jobs. At the national JWJ conference, three Portland State University SLAP students were able to come out of the shadows as undocumented students to stand in solidarity with OUR Wal-Mart Associates organizing to have a voice at Wal-Mart. Both the undocumented students and the OUR Wal-Mart Associates understood that they had the support of labor, faith groups, and other students to stand up for their rights and not fear repercussions. SLAP has created a model for students and workers to come together, build lasting organizations that challenge institutions which continue to perpetuate injustices in our communities as we help build a larger social movement. Using the time-tested strategies of generations of organizers, SLAP will make the world a better place. The students of this generation are true agents of social change, and SLAPatistas are answering the call: we cannot afford to live in the past, so in the spirit of tomorrow, we act today.